A piano ensemble charity event in northern China has created a new Guinness World Record. A total of 666 pianos were played simultaneously by 639 participants in Wuqiang County of Hebei Province on Saturday, setting a new world record. 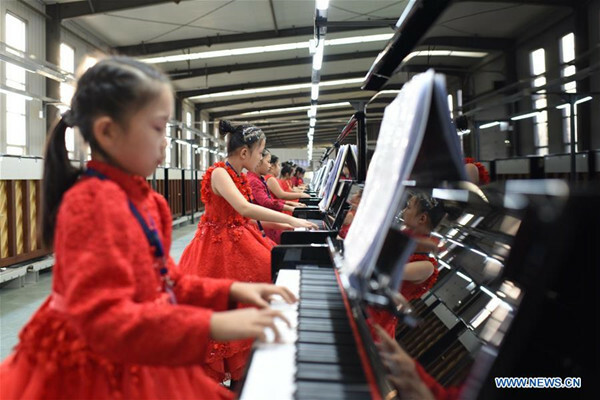 Pianists from eight countries and regions joined hands with blind children, as well as teachers, students and music lovers from around China. On the main stage, 40 pianos were placed to coincide with the 40th anniversary of China's reform and opening-up this year, while the rest of the pianos were placed in a local square. The pianos have a combined worth of more than 50 million yuan (7.3 million U.S. dollars). The event broke the record of 555 pianos playing simultaneously in Inchon of the Republic of Korea in 2007, according to Luo Qiong, the Guinness certification officer. Luo hopes that the event can spread musical education awareness among more people.